Become a Member of the Largest Harvard Community Outside of Cambridge! Harvard with members hailing from all University disciplines and across many generations. 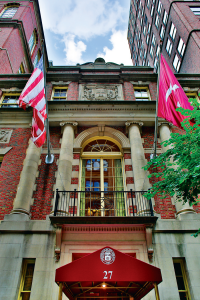 A landmark building located in midtown Manhattan, the Clubhouse is the hub for an extraordinary array of programming and events ranging from lectures and concerts to networking and social events. Dining options range from traditional elegance in the Main Dining Room to casual dining in the Grill Room and seasonal contemporary on the Rooftop. The Club’s unique guest rooms are well-appointed and offer a serene oasis from the busy streets outside. Work out in our fully equipped athletic facility complete with squash courts, read or relax in the Library, or be productive in the Work Center. The Club is one of New York’s top venues for distinguished private events offering a range of flexible event space, ambiance, and amenities. [post_content] => Just got your Harvard degree? For many recent grads, HCNY is a vital part of life in New York City. From professional and social networking to athletics, philanthropy – and a place to meet friends for happy hour – HCNY is a go-to place for young professionals in the city.